Apple Salad is irresistibly crunchy, fresh, and vibrant and belongs on your table this Thanksgiving and all Autumn long! 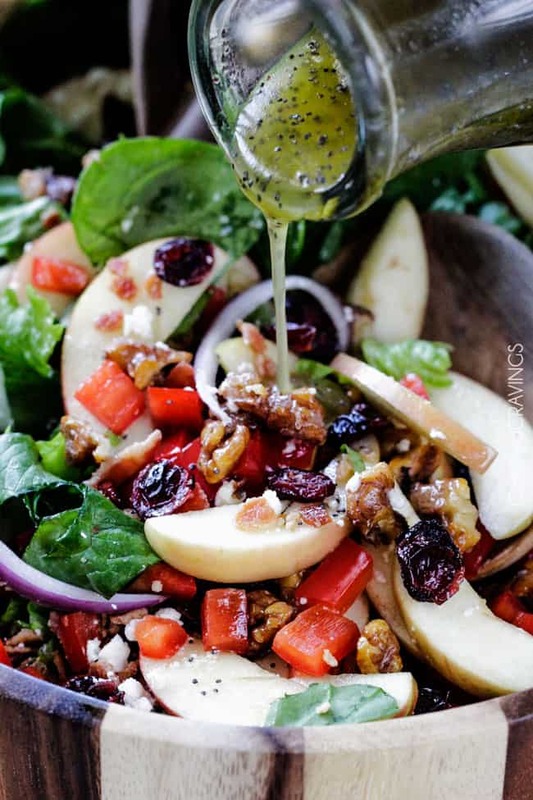 This Apple Salad is bursting with apples, cranberries, candied walnuts, bacon, and feta all drizzled with sweet and tangy Apple Poppy Seed Vinaigrette. Its a refreshing balance of sweet and savory and gorgeous for special occasions but easy enough for everyday. 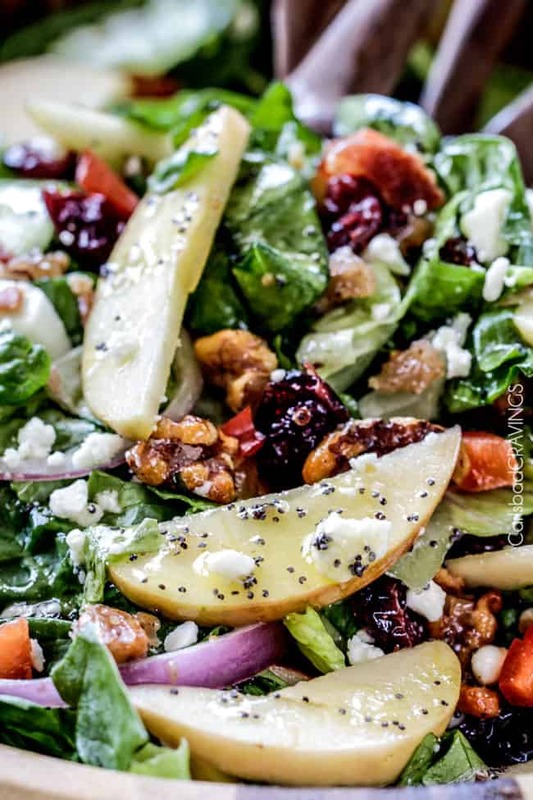 And you are going to want to this Apple Walnut Salad every day. 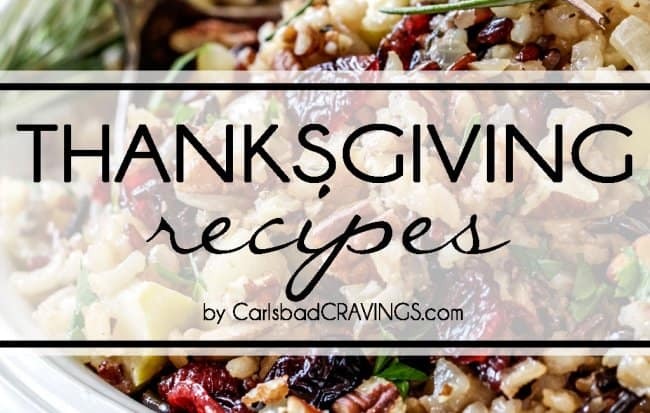 Its the perfect addition to your Thanksgiving feast because not only is it scrumptious and deceptively sophisticated, but it can all be prepared beforehand with the exception of slicing the apples for a NO STRESS side that everyone will rave about! Do you say Autumn or Fall? I’ve always said Fall because that’s how I grew up. I think it must be a location thing. By saying “Autumn,” however, I somehow feel more sophisticated – the power of one word. 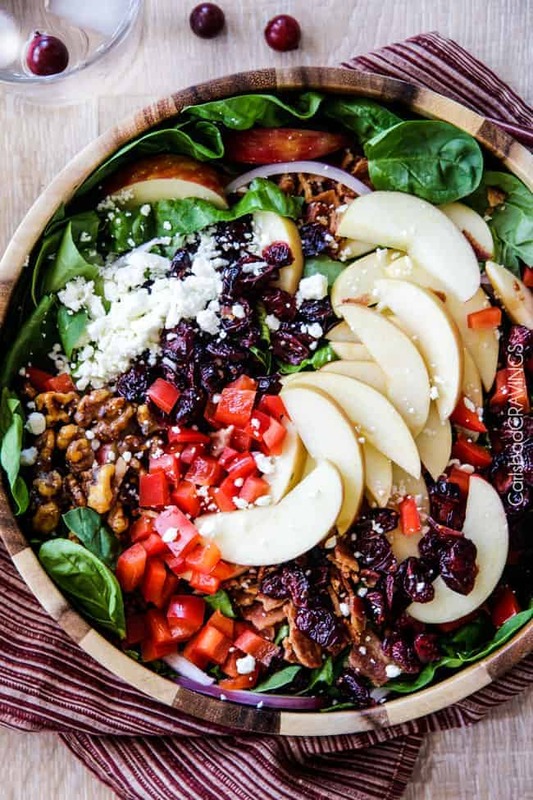 So I’m pretending for this post that I say Autumn just for make believe sophistication kicks – because look how sophisticated this Apple Salad looks?! But its also pretending. This Apple Salad requires no sophisticated skills to prepare but tastes like a salad from the finest restaurant. 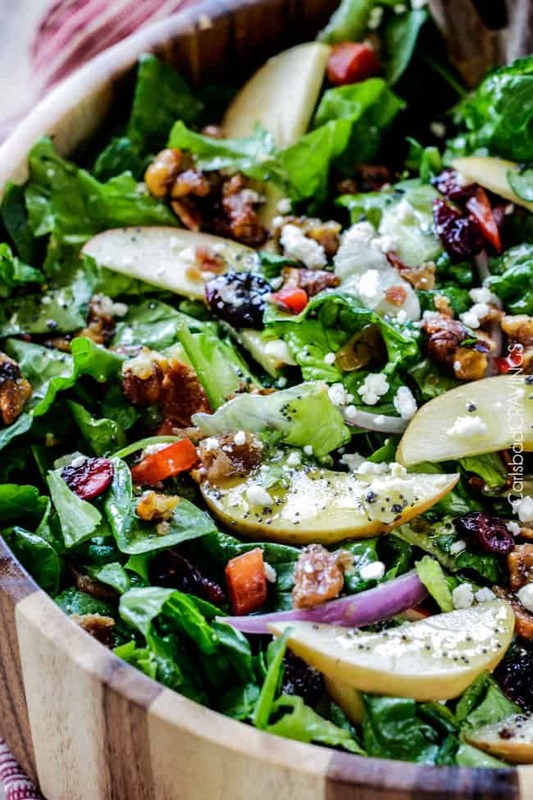 The salad is bursting with sweet and crunchy apples, juicy dried cranberries, salty, crispy bacon, crunchy red bell peppers, creamy feta and candied walnuts. Just imagine all that – in one bite! 2 apples: you will want to choose a sweet apple (Fuji are my fav) to complement the salty bacon and tangy red onions. You can slice your apples or chop them into chunks – totally personal preference. dried cranberries: dried cranberries just scream autumn to me! You can substitute them for other dried fruit such as dried cherries or apricots if you prefer. bacon: I like thick cut bacon for its extra flavor and because it is hearty enough to stand up to the dressing without immediate becoming soggy. red bell pepper: you can substitute or add in our favorite veggies or whatever you have on hand such as cucumbers or broccoli. 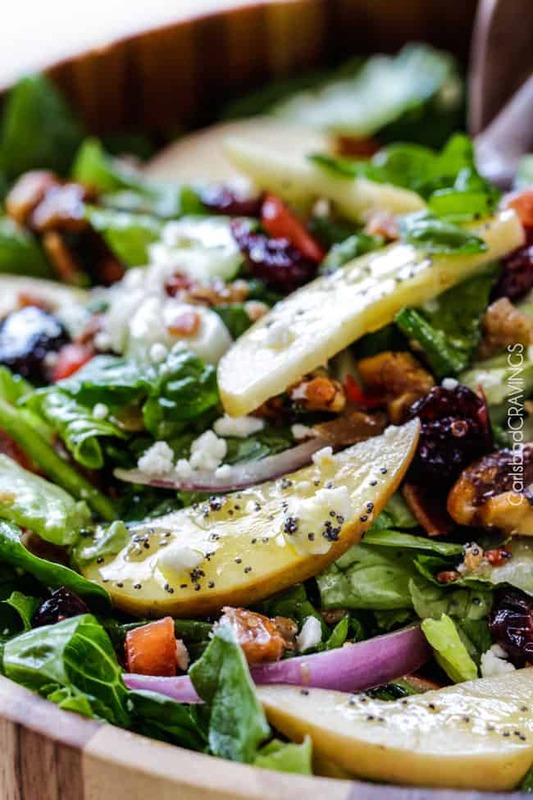 red onion: I think red onion is a must in this Apple Salad or else the salad is too sweet. You can chop your red onion if you prefer – thinly slicing is strictly for presentation because they look beautiful with thinly sliced apples. feta cheese: you can use your favorite crumbled cheese such as goat cheese or Gorgonzola. 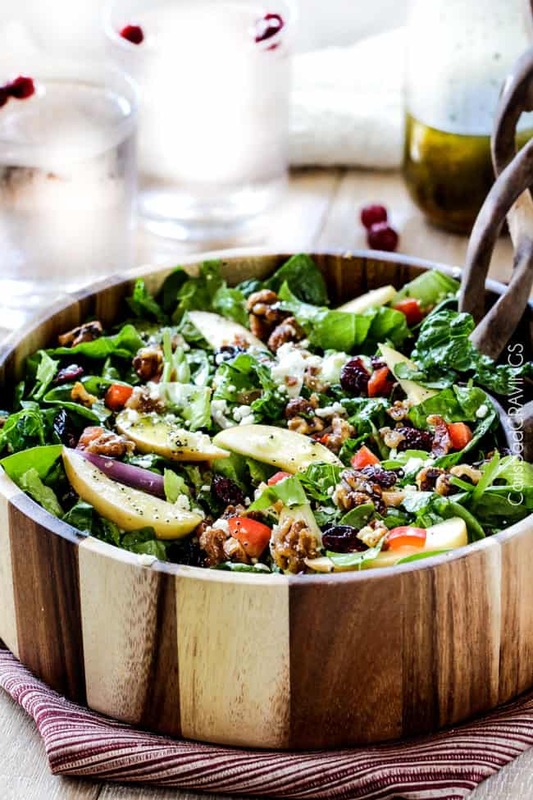 caramelized walnuts: the caramelized walnuts add a sweet addicting crunch that will be your favorite part of the salad! I use my 5 Minute Caramelized Nuts in this Apple Salad because it literally lakes 5 minutes and the nuts emerge beautifully caramelized, sweet and crunchy every time. 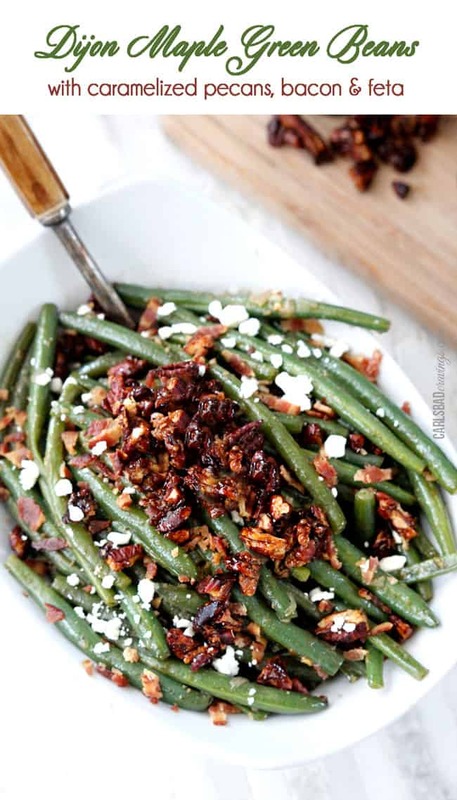 I chose to caramelize walnuts but you could swap them for pecans. How do you make Green Apple Salad? Make Dressing: Whisk all the Apple Dressing ingredients together in a bowl or shake in a jar. We want to make the dressing first so it has time to chill and the flavors to meld. Cook Bacon: Low and slow is the best way to cook bacon so the fat has time to render. Transfer cooked bacon to paper towels to drain excess grease. Caramelize Nuts: Add butter, sugar, and walnuts to a saucepan and let the magic happen. I like to roughly chop my nuts once cooled. 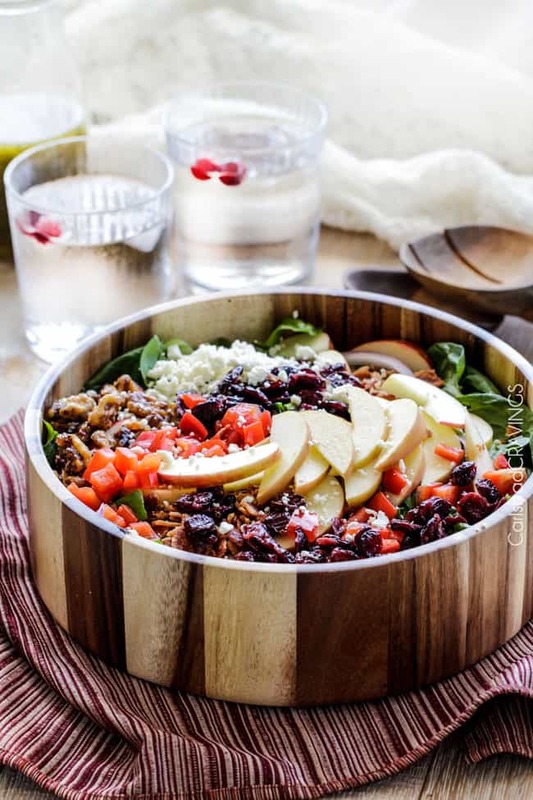 Assemble: Toss all of the Apple Salad ingredients together in a large bowl. You can either drizzle with desired amount of dressing and toss to combine (ONLY if you are eating right away and don’t expect leftovers) OR if you expect leftovers, serve the dressing on the side. Can I make my dressing ahead of time? : Yes! Make the Apple Dressing first so it has time to chill and the flavors develop. Not one likes warm salad dressing! You can also make it up to 5 days in advance and store in the refrigerator. Can I make my dressing sweeter? : I would start with one tablespoon sugar than add additional sugar one tablespoon at a time to reach desired tangy sweetness. Can I Prep the Salad Ahead of Time? 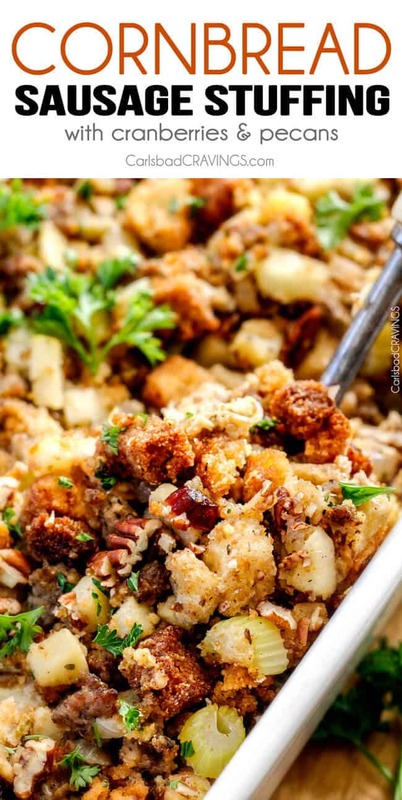 : You can prepare the dressing, bacon, caramelized walnuts, red bell peppers and red onions the day before so all that’s left to do is chop 2 apples – that’s it for for an easy side that doesn’t require the oven. Can I use different nuts? 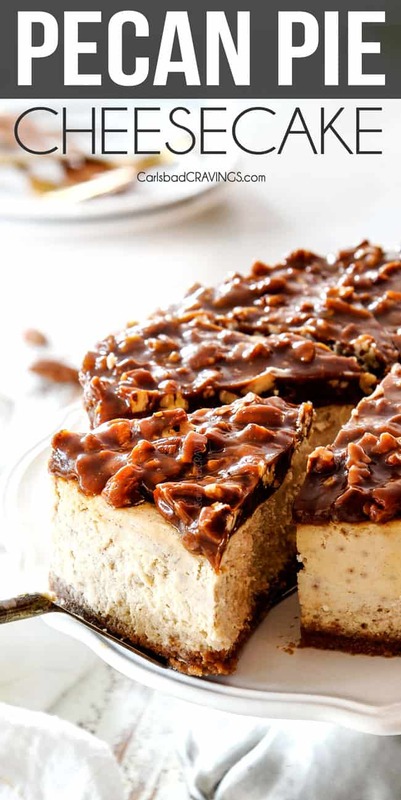 You can swap the walnuts for pecans if you prefer. If you don’t want to caramelize your own nuts, then you can buy them at specialty stores such as Trader Joes. Can I add other vegetables? Yes! Cucumbers, shredded carrots, broccoli, etc. would all be delicious. Can I add protein? Absolutely ! Make this Apple Salad a main dish by adding chicken, shrimp or tofu. Can I add grains? 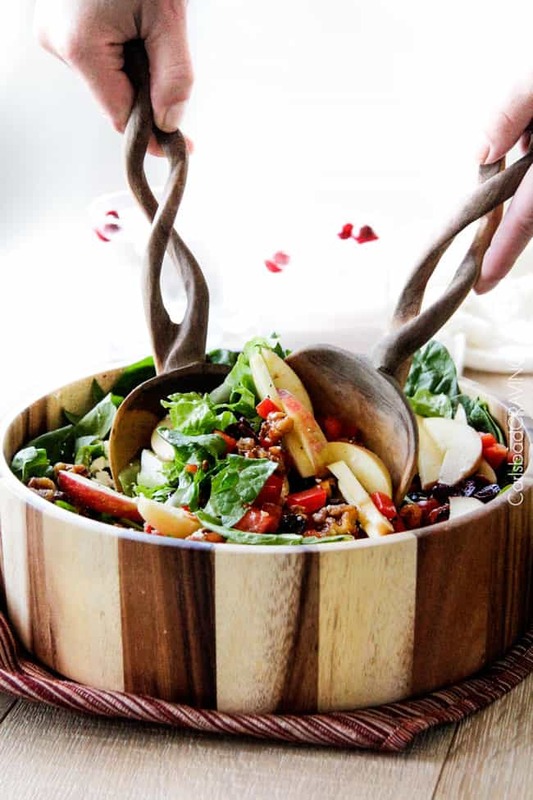 I think this Apple Salad would be superb with the addition of cooked quinoa or wild rice – yum! Can I use a different cheese? You can any soft crumbly cheese such as goat cheese, blue blue cheese or Gorgonzola. Can I double this recipe? This Apple Salad is easy to double the recipe for a crowd or cut it in half for lunches. How do I keep Apples from Turning Brown? My favorite way to keep apples from oxidizing and turning brown after slicing is to put them in a bowl of apple juice. This way they don’t become bitter like soaking in lemon juice can do. Alternatively, you can toss them in some of the dressing because the apple cider vinegar will help keep them fresh. Thirdly, If you only have lemon juice on hand, then mix 1/2 cup water and 2 tablespoons lemon and then toss your apples in the mixture. All of these methods will prolong the oxidation process, but you still want to slice your apples as close to serving as possible. The Apple Poppy Seed Vinaigrette is a quick whisk of apple cider vinegar, honey, sugar, dry minced onion and olive oil and tastes like gloriously refreshing sweet and tangy apples and poppy seeds. And just a note – I was wondering why my dressing was looking kind of green – but then I remembered from kindergarten that yellow honey/apple cider vinegar + blue poppy seeds = somewhat green AH-mazing dressing. Toss all the deliciousness together and you have a harmony of flavor and texture that is so drool worthy, you won’t be able to stop crunching its heavenly goodness. When’s the last time you cold say that about a salad?! 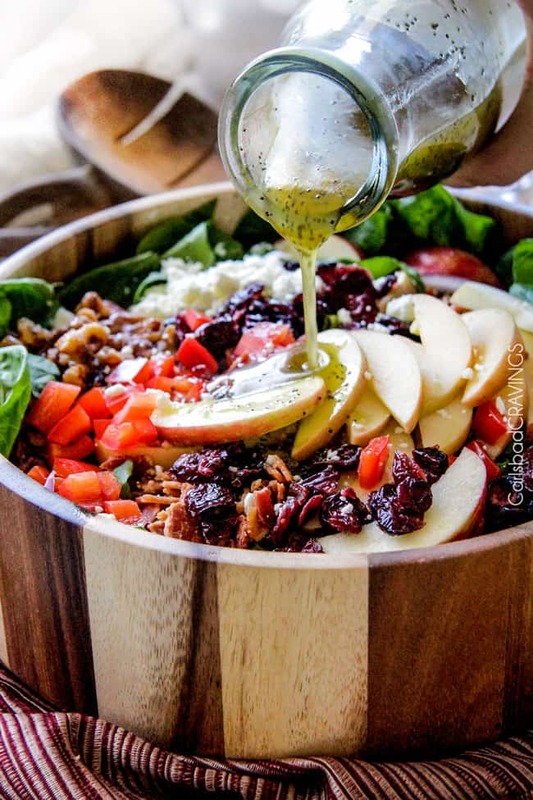 Want to try this Apple Salad Recipe? Add all of the dressing ingredients to a medium bowl and whisk to combine or shake in a mason jar. Refrigerate while you prepare the salad ingredients then whisk/shake again before drizzling over salad. The dressing can be made up to a week in advance. Thanks Debra, I think you’ll love it!